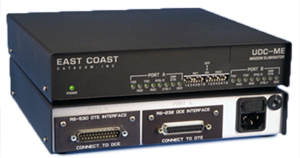 The Digital Mixing Module X.21 (DMM-X21) provides the network manager with a cost effective means of expanding existing, leased line polled networks without adding computer ports or communications links. With the DMM-X21, up to 4 DTE or DCE devices can share the same port and communications link using the contention and control protocols normally resident in the host hardware and software. Once installed, system and network efficiency are increased through higher host processor utilization coupled with the significant decrease in idle time between host / terminal traffic sessions. Ideal for synchronous network environments, the DMM-X21 is protocol transparent at data rates up to 1.024Mbps. Data arriving at the Master Port is continually broadcast to all Subchannels. The attached terminal device that raises the Control (C) or Indicate (I) signal is automatically given control of the DMM-X21 until data transmission is complete. Clocking is accomplished from the attached Digital Modem. The DMM-X21 incorporates optional Anti-Streaming circuitry. If enabled, Anti-Streaming will automatically remove a defective terminal from service if the Control (C) or Indicate (I) signal is present longer than the user predefined selection period. Elastic Tail Circuit Buffers compensate for systems having different clock sources. Large 512 bit buffers enable the DMM-X21 as an ideal choice for VSAT or land line applications. The DMM-X21 is equipped with an internal 110/220VAC switch selectable linear power supply and has a three year warranty.The UDC-ME V.35 modem eliminator allows two DTE devices (such as routers) to communicate within proximity of each other. The UDC-ME transmits data bidirectionally at clock rates of 1.2k up to 3.072Mbps between DTE devices. All clocking and signal crossover are provided within the UDC-ME. The unit is equipped with two interface slots that allow a host of serial interface cards to be utilized. The serial interface cards available are RS-232, RS-422/449, RS-530, X.21, V.35 and HSSI. The Serial Interface cards are interchangeable and may be mixed such as RS-232 to V.35 thus eliminating the need for an interface converter or changing expensive serial cards on a DTE device such as a router. 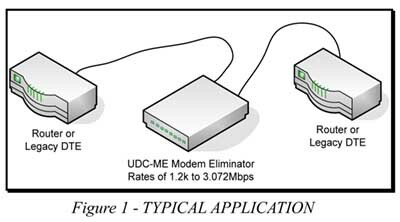 The UDC-ME V.35 modem eliminator is also an excellent choice for testing router-to-router connections via the serial ports. The unit is an excellent choice for interconnecting your LAN or legacy mainframe equipment.